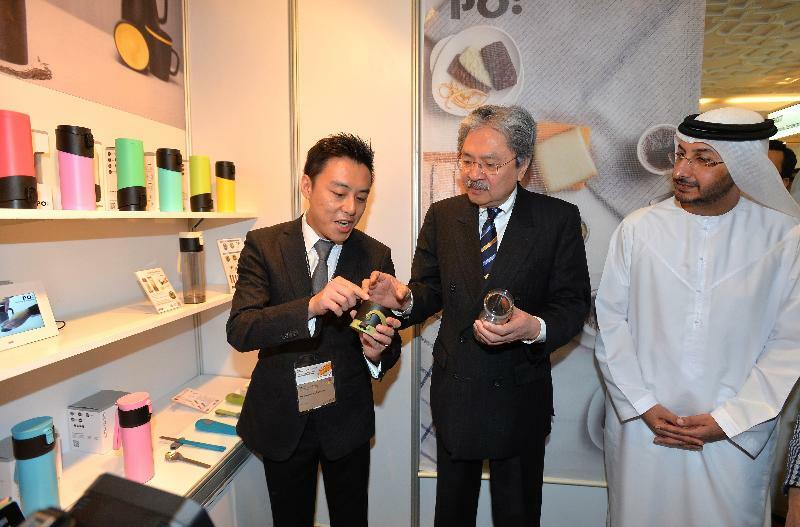 The Financial Secretary, Mr John C Tsang, who is leading a business mission, started his visit in Dubai today (November 6, Dubai time) to foster closer trade and economic relations between Hong Kong and the United Arab Emirates (UAE). Members of the business delegation come from a variety of sectors, such as finance, trade, logistics, infrastructure, tourism, telecommunications and technology. 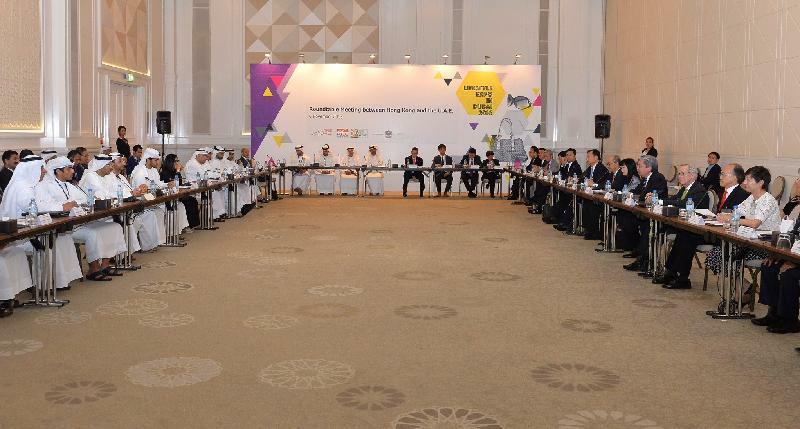 In the morning, Mr Tsang and the Undersecretary of the Ministry of Economy of the UAE, HE Abdullah Ahmed Al Saleh, co-chaired a roundtable meeting for Hong Kong and UAE business leaders to explore collaboration opportunities in areas such as finance, logistics and infrastructure. 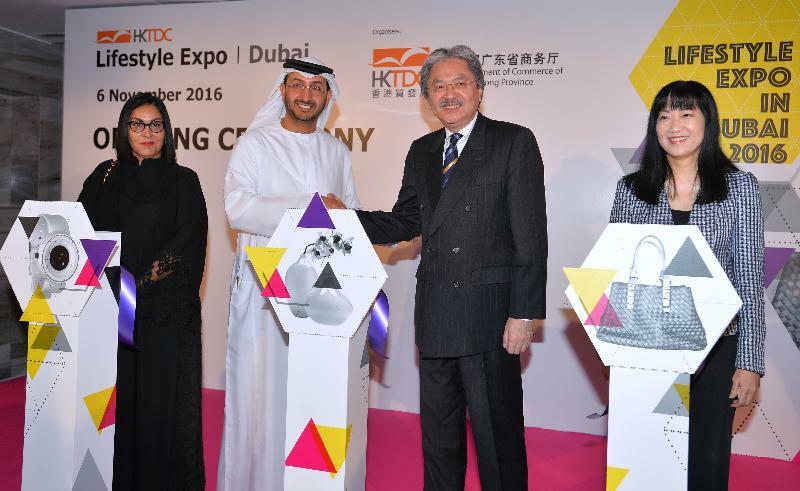 They later officiated at the opening ceremony of Lifestyle Expo in Dubai 2016, jointly organised by the Hong Kong Trade Development Council (HKTDC) and the Department of Commerce of Guangdong Province. The Expo showcases products of Hong Kong enterprises and helps these enterprises expand business in overseas markets. 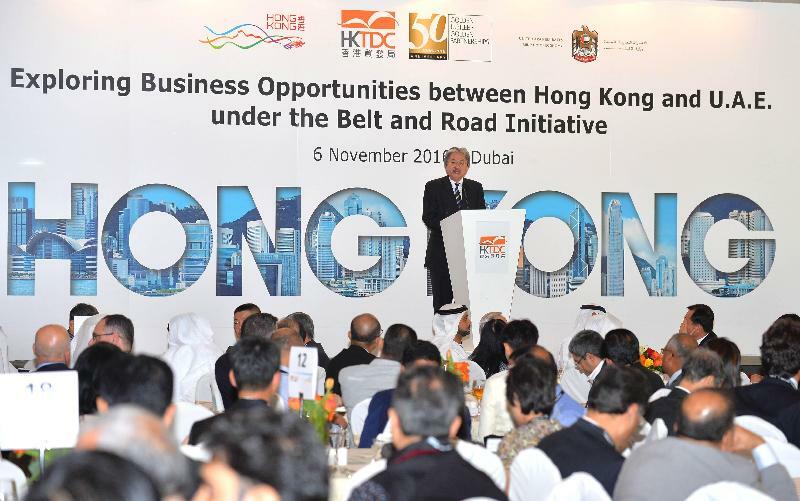 Addressing about 300 business representatives at an HKTDC networking luncheon, Mr Tsang pointed out that the grand and visionary Belt and Road Initiative will be the driving force of the global economy in the 21st century. Both the UAE and Hong Kong have what it takes to be key business and logistics hubs for the Belt and Road region. Mr Tsang elaborated on Hong Kong’s unique strengths under the "one country, two systems" framework, from the rule of law and an independent judiciary, to the favourable business environment, the fair and open market, the free flow of capital as well as the robust intellectual property rights protection regime. "More than an international financial centre, Hong Kong is China’s international financial capital and the world’s largest offshore Renminbi business centre. Hong Kong has the experience, the expertise and the connections to serve as the financing and investment management hub for infrastructure projects along the Belt-Road corridors," he said. "Given the substantial Muslim population living along the Belt and Road corridors, the future of Islamic financial services is highly promising. Over the past two years, the Hong Kong SAR Government has issued two sukuk that has drawn strong interest from the investors around the world and in the Middle East. The successful issuance demonstrated that the legal and regulatory framework of Hong Kong can support the development of sukuk, and it also shows the confidence international investors have in Hong Kong," he added. 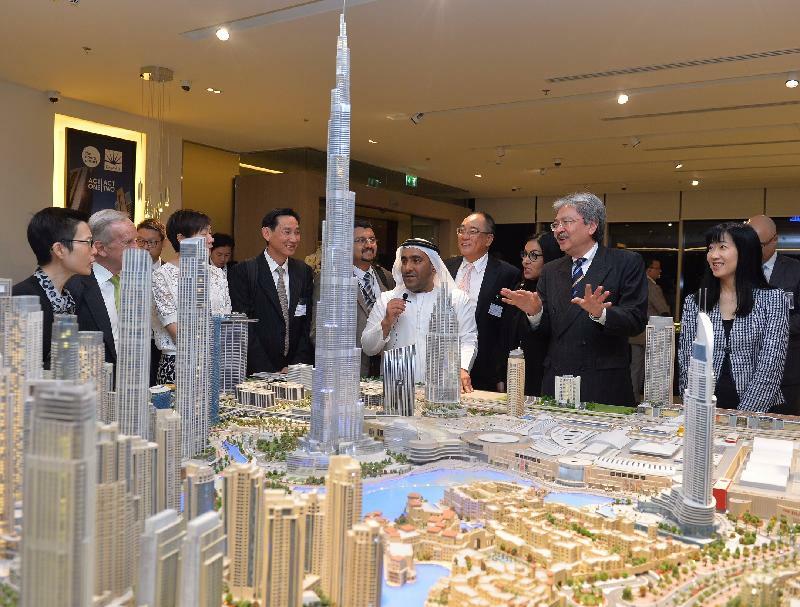 In the afternoon, Mr Tsang received a briefing on the latest innovation initiatives in Dubai, such as the "Smart Dubai" initiative, the hosting of the World Expo 2020, as well as dedicated measures to foster a culture of innovation within the government. 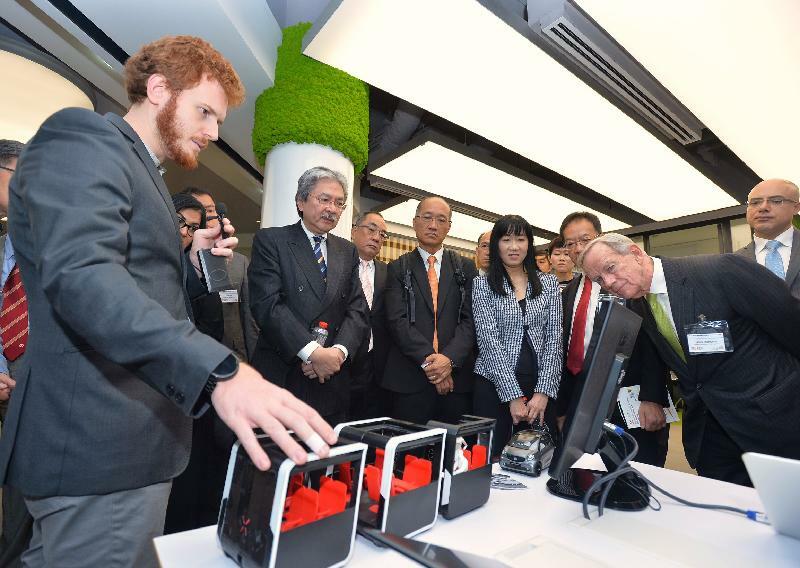 He also visited an office building created by 3D printing technology. The visit today was concluded with a briefing by a leading UAE-based global property developer on Dubai’s infrastructural development. Tomorrow (November 7, Dubai time), Mr Tsang will continue his visit in Dubai.